Financial management is important to the companies such as financial institutions to manage their assets and liabilities. The banks or financial institutions have to achieve various goals in optimizing the financial management such as asset accumulation, liability reduction, equity, earning, profitability and optimum management items. Therefore, goal programming has been introduced to optimize the financial management since it involves multiple goals. Goal programming is a mathematical model which aims to solve multiple objectives decision problems. 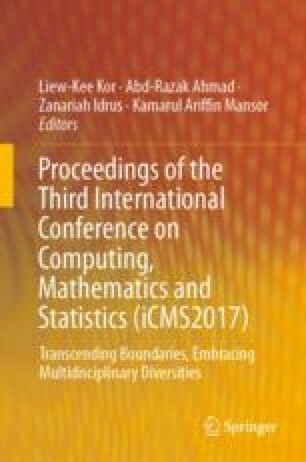 The objective of this study is to develop a mathematical model to optimize the financial management of RHB Bank in Malaysia with goal programming approach. Six goals from the financial statements, namely total asset, total liability, total equity, profit, earning and optimum management items are investigated for the period from year 2011 to 2015. The results of this study show that all goals are fully achieved based on the mathematical model with goal programming approach. Besides that, the potential improvements for asset, liability and equity have been identified in this study. This study is significant because it helps to develop a mathematical model to examine the financial strengths and determine the potential improvements for RHB Bank in Malaysia.